Astronomers using the NASA/ESA Hubble Space Telescope have studied a giant filament of dark matter in 3D for the first time. 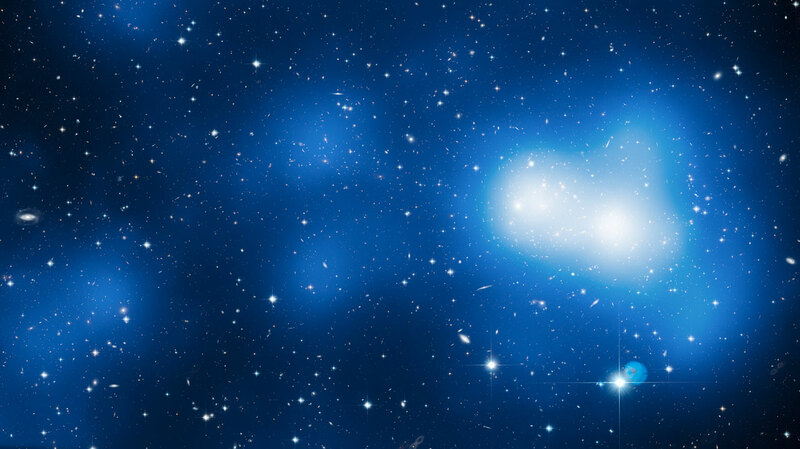 Extending 60 million light-years from one of the most massive galaxy clusters known, the filament is part of the cosmic web that constitutes the large-scale structure of the Universe, and is a leftover of the very first moments after the Big Bang. If the high mass measured for the filament is representative of the rest of the Universe, then these structures may contain more than half of all the mass in the Universe. The theory of the Big Bang predicts that variations in the density of matter in the very first moments of the Universe led the bulk of the matter in the cosmos to condense into a web of tangled filaments. This view is supported by computer simulations of cosmic evolution, which suggest that the Universe is structured like a web, with long filaments that connect to each other at the locations of massive galaxy clusters. However, these filaments, although vast, are made mainly of dark matter, which is incredibly difficult to observe. The first convincing identification of a section of one of these filaments was made earlier this year . Now a team of astronomers has gone further by probing a filament’s structure in three dimensions. Seeing a filament in 3D eliminates many of the pitfalls that come from studying the flat image of such a structure. “Filaments of the cosmic web are hugely extended and very diffuse, which makes them extremely difficult to detect, let alone study in 3D,” says Mathilde Jauzac (LAM, France and University of KwaZulu-Natal, South Africa), lead author of the study. 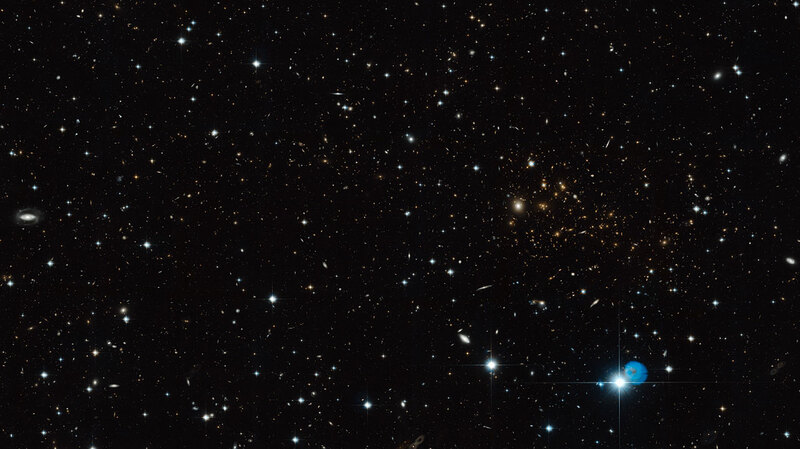 The team combined high resolution images of the region around the massive galaxy cluster MACS J0717.5+3745 (or MACS J0717 for short), taken using Hubble, NAOJ’s Subaru Telescope and the Canada-France-Hawaii Telescope, with spectroscopic data on the galaxies within it from the WM Keck Observatory and the Gemini Observatory. Analysing these observations together gives a complete view of the shape of the filament as it extends out from the galaxy cluster almost along our line of sight. The team’s recipe for studying the vast but diffuse filament combines several crucial ingredients. First ingredient: A promising target. Theories of cosmic evolution suggest that galaxy clusters form where filaments of the cosmic web meet, with the filaments slowly funnelling matter into the clusters. “From our earlier work on MACS J0717, we knew that this cluster is actively growing, and thus a prime target for a detailed study of the cosmic web,” explains co-author Harald Ebeling (University of Hawaii at Manoa, USA), who led the team that discovered MACS J0717 almost a decade ago. Second ingredient: Advanced gravitational lensing techniques. Albert Einstein’s famous theory of general relativity says that the path of light is bent when it passes through or near objects with a large mass. Filaments of the cosmic web are largely made up of dark matter  which cannot be seen directly, but their mass is enough to bend the light and distort the images of galaxies in the background, in a process called gravitational lensing. The team has developed new tools to convert the image distortions into a mass map. Finally: Measurements of distances and motions. Hubble’s observations of the cluster give the best two-dimensional map yet of a filament, but to see its shape in 3D required additional observations. Colour images , as well as galaxy velocities measured with spectrometers , using data from the Subaru, CFHT, WM Keck, and Gemini North telescopes (all on Mauna Kea, Hawaii), allowed the team to locate thousands of galaxies within the filament and to detect the motions of many of them. A model that combined positional and velocity information for all these galaxies was constructed and this then revealed the 3D shape and orientation of the filamentary structure. As a result, the team was able to measure the true properties of this elusive filamentary structure without the uncertainties and biases that come from projecting the structure onto two dimensions, as is common in such analyses. The results obtained push the limits of predictions made by theoretical work and numerical simulations of the cosmic web. With a length of at least 60 million light-years, the MACS J0717 filament is extreme even on astronomical scales. And if its mass content as measured by the team can be taken to be representative of filaments near giant clusters, then these diffuse links between the nodes of the cosmic web may contain even more mass (in the form of dark matter) than theorists predicted. So much that more than half of all the mass in the Universe may be hidden in these structures. The forthcoming NASA/ESA/CSA James Webb Space Telescope, scheduled for launch in 2018, will be a powerful tool for detecting filaments in the cosmic web, thanks to its greatly increased sensitivity. The research is presented in a paper entitled “A Weak-Lensing Mass Reconstruction of the Large-Scale Filament Feeding the Massive Galaxy Cluster MACSJ0717.5+3745”, to be published in the 1 November 2012 issue of Monthly Notices of the Royal Astronomical Society. The paper will be published online this week. 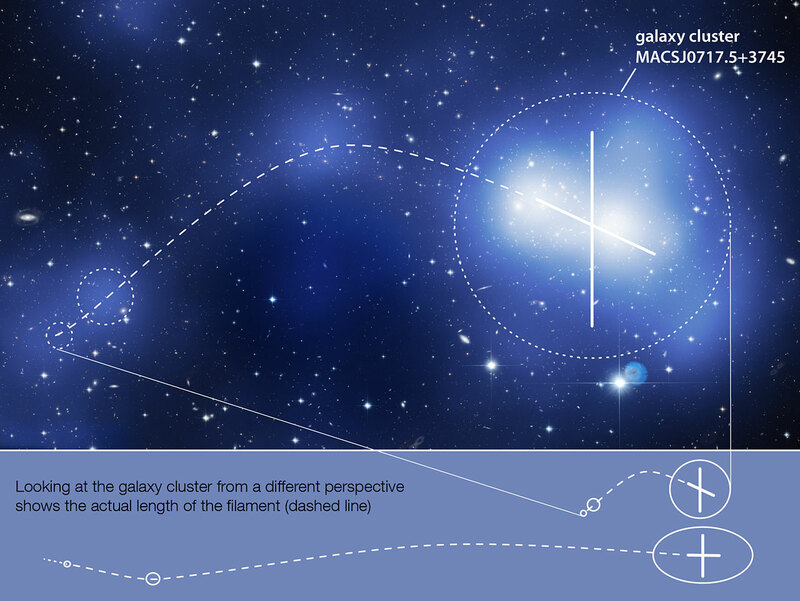 The first identification of a dark matter filament was published in J. Dietrich et al, “A filament of dark matter between two clusters of galaxies” published in Nature on 4 July 2012. Dark matter, which makes up around three quarters of all matter in the Universe, cannot be seen directly as it does not emit or reflect any light, and can pass through other matter without friction (it is collisionless). It interacts only by gravity, and its presence must be deduced from its gravitational effects, for example its effect on the rotation rate of galaxies and its ability to deflect light according to the theory of general relativity. The light captured by telescopes encapsulates information about the object that emitted it. One important application of this is to study the redshift of an object (the extent to which its light is reddened by the expansion of the Universe) which can be used to measure distances. Estimating distances based on the relative brightnesses of colours that galaxies appear in images is done using a technique called photometric redshift. Although the precision of the distance estimate is limited, it is a relatively straightforward technique to use on large numbers of galaxies, and it works well even for faint objects. Spectrometers analyse the detailed properties of the light coming from an object. In this study, the subset of galaxies observed with spectrometers provided detailed information on the motion of the objects within the filament.